In California’s Central Valley, research on an innovative approach for converting riverside habitats into multi-use areas offers a new way for fish and farmers to coexist. But will the toxic legacy of the Gold Rush haunt efforts to find common ground on these highly contested lands? For most of us, our first exposure to salmon comes in the form of orange slabs of flesh on a bed of ice. However, salmonids (a term that refers to salmon, trout, and their relatives) are an extraordinarily diverse and iconic group of fishes. Whether found in the depths of cold lakes or flinging themselves upstream in fast-moving rivers, these creatures have evolved remarkable strategies for surviving in challenging environments. Despite their ability to live in diverse landscapes and cope with dramatic seasonal changes in their environment, many populations of salmonid fishes are in severe decline. A recent report published in the journal Environmental Biology of Fish warns of the impending extinction of 78% of native California salmonid species within the next century if current trends continue. Because three quarters of these species are found only in California, their disappearance would represent global extinction. While the causes of decline are complex, the physical alteration of California’s aquatic habitats is thought to be a key threat to native fish populations. Historically, rivers carried rainwater and snowmelt from the Sierra Nevada each year, causing frequent flooding throughout the Central Valley. These seasonally inundated “floodplain” habitats acted as nurseries for young salmon during their migration to the sea. However, in the mid 1800s, agriculture gained a foothold in the region and farmers sought to protect their crops from the floodwaters by lining the riverbanks with earthen levees. “The Central Valley was once an ephemeral winter floodplain spread over millions of acres, but the vast majority of that is now gone,” said Jacob Katz, a research biologist with California Trout. Although the construction of these levees has provided a powerful way to physically alter the landscape, many are now in danger of collapsing. To alleviate flood risk, the California Department of Water Resources has proposed a flood prevention plan that would expand the floodplain and move the levees farther from the edge of the river. 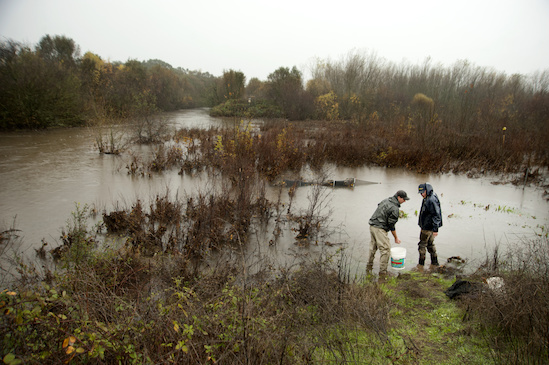 The aim of the proposed plan is not only to help reduce flood risk in Sacramento, but also to restore aquatic habitats. Some farmers, however, have pushed back against plans that they say disproportionately impact the rural agricultural economy. In an era of “fish vs. farmer” disputes, the need for solutions that reconcile fish conservation goals and agriculture has arguably never been more important. Enter the Nigiri project, a clever name for a simple idea: how can we manage existing rice fields in California’s Central Valley to function as salmon habitat during the winter? These results illustrate a way that farmers and conservationists may cooperate and benefit simultaneously. But the story doesn’t end there. In this case, damage from historical land-use practices in California provides an additional wrinkle of complexity. In the Central Valley, efforts to create multi-use floodplains must exist on landscapes with a legacy of mercury contamination. As a result of decades of mercury mining in Northern California’s Coast Range and gold mining in the Sierra Nevada, the Central Valley watershed is highly contaminated with mercury. Although much of this mercury is buried in the sediment, fluctuating water levels in shallowly flooded wetlands, including rice fields, can lead to its release into the water. Microbial reactions then convert mercury to methylmercury, a neurotoxin that has been shown to cause brain damage and behavioral alterations in Atlantic salmon. According to some researchers, however, the rapid growth rate of salmon reared on rice fields might be the “silver lining” of this issue. “One way to reduce mercury concentrations, not necessarily exposure, but concentrations in fish is to promote certain circumstances where they have very rapid growth rates,” said Collin Eagles-Smith, a USGS research ecologist. In other words, a faster-growing fish may be exposed to the same amount of mercury over the course of its lifetime, but its higher overall weight could translate into a smaller concentration per gram of tissue. 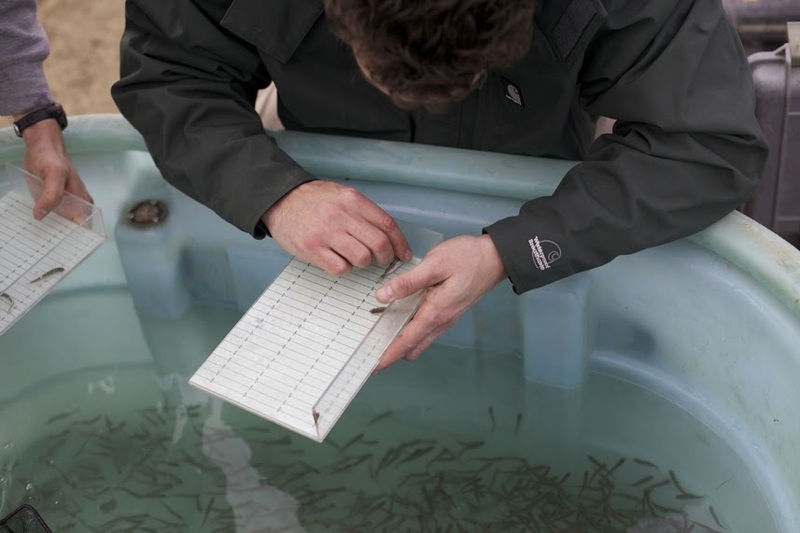 Researchers measure the length of a juvenile Chinook from an experimental floodplain. Photo credit: Jacob Katz. While it remains unclear whether methylmercury is impacting fish health in the Central Valley, the negative impacts of the compound as it travels up the food chain to fish-eating birds and mammals are better understood. Mercury has been found to have a host of impacts on birds living in the San Francisco Bay area, from impaired stress hormone responses in chicks to reduced nesting success. Landscapes in California are fraught not only with present day conflicts over environmental resources, but also with the vestiges of past land-use practices. The burden of history appears to slow the progress of much-needed reconciliation projects at times, particularly when the ticking of the extinction clock seems to grow louder each day. However, it also offers a cautionary tale to willing listeners. The imprint of human activity, even that which is decades old, has important consequences as we work to restore healthy functioning ecosystems. In the end, balancing cautious, knowledge-based progress with the urgency of present day environmental issues is likely to remain one of the key challenges as we move forward. This article was very interesting. I had no idea that the salmonoid population was declining. After reading this article, the idea of reconciliation seems like a difficult task. The Nigiri Project sounds like a great reconciliation idea because salmon and farmers are benefiting. However, the fluctuating water levels can release mercury and that leads into a negative cycle through the food chain. No doubt past exploits have slowed today’s innovation of reconciliation, but with time, I hope we can come up with a plan that leads to a better future. This article provided me with a lot of great information that was new to me. After reading it, I definitely agree with the establishment of the Nigiri Project. This will definitely put an end to the arguments between farmers and fish. It is a great solution that will benefit both sides. Not only that, but it will target an important issue: the extinction of salmonid fish. It is better to do something than to let salmon slowly die off. Every species is valuable so any approach to help its survival is important. I only have a concern about the exposure to mercury; however, the return of the fish population is the main priority right now. Over time, we can hopefully find a better solution. Humans and other species have to agree on its reconciliation if they both want to survive. Earth is everybody’s home so this project is definitely a start to a great solution. Shala’s article was very insightful. I wasn’t aware of the threat to the Salmonid population. It’s surprising how 3/4 of the species are found only in CA and bordering on global extinction. If that’s the case, our salmonids are in crisis and the general public should be alerted of this issue. The proposed idea of moving the levees back to restore aquatic habitats sounds like a great idea that needs to be implemented. Who knew that farmers lose access to water for restoration in the San Joaquin River where salmon congregates. I wonder if eating salmon affected by methylmercury affects human ingestion. It’s always a reality check to know how one thing that affects one species could have such a domino effect on the food chain as a whole. I think the Nigiri project seems a good plan for the declining California native salmon populations. Using a rice field for multi purpose is beneficial for the farmers and the environment. But the impact of methyl mercury should be well understood, as well as the impact of growing salmons on the rice fields, to prevent future disputes. In addition to their study on growing salmons faster to reduce mercury accumulation, they may study other options such as bioremediation. Since salmons are a food source for many animals, making sure it is safe for consumption should be clear before production. I really enjoy the Nigiri project, personally I view that there are an infinite amount of stressors on our rivers and river dwelling species. What my concern is has to do with the other numerous stressors with in the ecosystem. There is a decline in water, increases pollution, unknown amounts of mercury. A massive amount of adaptive management would have to be implemented. The idea is great and I am all for maintaining and improving the native salmonids, so anything that may aid them should be prioritized and this seems like a great method of doing so. The Nigiri project seems like a great starting point for bringing the salmon population towards the right track. A relationship where both sides benefit greatly. Mercury is something that must be monitored due to the possible dangers associated with consuming contaminated fish. We must not over react to the possibility of Mercury contamination in our sediments, maybe we can develop new innovations to bring it down or there is just not much Mercury present. Science must drive this perspective and we must exercise all of our options first. We must innovate and find a realized niche for our Salmon species. I love Salmon, It is sad to see the list of extinct species getting larger; and all due to humans. This article gave me a lot of information i never knew. I never knew the salmonoid population was decreasing significantly in our region especially when 3/4 of the entire population resides in California. The Nigiri project seems to have a lot of beneficial ideas to help out both the salmonoid population and the agricultural famers. The levees we have implemented in our area has been more of a problem than a resolution. The nigiri project will not just allow salmon populations to increase by adding them to floodplains that are farmed with rice but also maintain flood control, increase bypass outflows to improve delta food web, and improve adult fish passage while reducing juvenile fish stranding. The only one negative i see is the implementation of Mercury, which is not just harmful to fish but extremely harmful to humans. People do not keep up with our problems we have and will not be aware of the harm that eating this fish can do to them. This Nigiri project is a great starting point but there is a lot more we need to do to fix this problem. I really like the level of transparency this article present. I think we have all the tools and knowledge to reverse the trend but unfortunately, economical propaganda associated with water quality and salmon habitat in the central valley have prevented even the simplest solutions to be viewed as economical burdens.To my opinion,the integration of salmon in rice fields will be the most effective plan on preserving the decreasing salmon population. Nigiri Project will also be more sustainable, because it will mimic nature by creating a symbiotic relationship between fish and rice.This will not only lead to increased yields of rice production but also restoring the decreased salmon population. I moved to Sacramento almost two years ago and I am going to make the best effort to go out and fish salmon this year (and help to financially support their recovery). It would be a shame not to get a chance to appreciate these species to the fullest. Last year, I took a class at Sacramento State and the instructor shared how the Atlantic Salmon run is basically dead. Hopefully changes can be made because it’s sad to think most of these species have a great possibility of becoming extinct and become like the East Coast. I’ve heard about mercury levels being high in rice, so I am worried about the mercury content in salmon fry. I wonder how different the mercury contribution is when compared to river systems. Fish, such as non-native bass, accumulate high levels of mercury. However, salmon species that live in these same environments naturally do not have the same levels. This possibly applies to the salmon fry in the rice fields?? This article nicely summarizes the possibility of combining water allocation to both agricultural lands and habitat uses. The combination of rice fields as a hydrophytic crop and salmonids makes simple ecological sense, however the largest water use issue regarding agriculture during times of water shortages (such as the current drought mirroring the 1977 drought) are orchards which have a large water demand year long. The main difference is when water is limited, rice can be planted in the wet years and harvested, while serving the dual purpose with salmonid habitat. In contrast orchards are water demanding long term crops, which require irrigation year round and cannot be flooded to provide the much needed salmonid habitat. As water resources become more limiting during dry years, the fight between fish and farmer may continue, but laws currently support endangered species. Arguably, salmonids are more lucrative and endangered than California agriculture, and hopefully habitat will continue to be the primary choice for water allocation. I think that the Nigiri project would answer a lot of problems that have been slowing the ecological and agriculture mutual progress. By combining both systems we would be able to increase salmonid reproduction and sustainibility, as well as help California rice farms increase their annual yields. I think that the project can be really helpful with both parties and in an area of the world where both salmon and rice production are main exports of the region. The Nigiri project has a lot of things going for it, including a clever name. By looking at the past mistakes created when the levees streamlined the rivers in California, we are looking for better solutions to create flood control, water availability, native habitat, all the while not impeding on agricultural and urban land. By prioritizing natural floodplains because of their immense importance to native fish species that have been relied upon by local communities for their sustenance and financial value and for millenia, we can begin to incorporate other values such as agricultural land and flood control into our new land usage schemes. By connecting previously isolated patches of rice fields during the winter season when they being fallowed, habitat for young native fishes, especially chinook, coho, and steelhead, can be greatly increased. By going forward with preliminary experiments, the Nigiri project has been able to expose limiting factors that can negate the benefits of using rice fields as salmonid habitat. Methyl Mercury accumulation in the rice fields may become exacerbated if they are inundated for salmonid habitat. Solutions to the Mercury poisoning issue may have arisen without much effort due to the richness of the rice fields as salmonid habitat. The growth rate of the salmonids using the rice field patches has been so immense that the amount of Mercury in the body of the fishes may be negligible. Using land for multiple purposes is the only way to move forward. I feel that this article really brings awareness to how much the population of salmonoids have dropped. With having 3/4 of the population based in California, I feel that it is our responsibility to save these salmonoids from going extinct. The Nigiri project is a good stepping stone to help relieve some issues of the declining population and farmers loosing their land. Its preliminary data shows that the fish are thriving in this environment while also providing economical support to farmers. I feel that if more of these projects are created, there could be great benefit to bringing back these populations. The only way to really know if the residual mercury is impacting bird species is to keep collecting data and going from there. On an unrelated note, I thought it was funny to call it Nigiri cause the project took place in rice fields raising salmon. It’s disheartening to know that in the near future, if current environmental conditions for these salmon do not change for the better, they will be extinct. Although the Nigiri Project is an excellent plan to provide a new area for young salmon to feed and grow without compromising agricultural areas, the potential effects of mercury on the salmon and eventually up the food chain is alarming. More effort needs to be made by everyone to find a balance between protecting wildlife and providing agricultural needs in California. These rice fields, through the years, may be detrimental to everyone’s health and should not be the final solution to the problem. Knowing that the effects of the past has brought on these problems today should serve as a lesson to Californians. Wow, I had no idea California held three quarters of the Salmonid species. The clock is ticking and something has to be done to avoid their disappearance. The Nigiri project seems like a great solution because experimental fields have already shown promising results. Growth rates would end up increasing. The only problem with this solution though is that fluctuating water levels in the rice fields can lead to the release of Mercury in the water which would not be good! We need to speed things up so both farmers and fish can coexist. This would be a phenomenal project to undertake because what better way to restore fish habitat AND continue agricultural production. The Nigiri Project seems to provide some answers to the dwindling Salmonid populations through mimicking natural processes. In response to the potential mercury contamination issue, I believe that there may be a bioremediation I have head of where a fungus can be introduced to the contamination site and it will absorb some of the heavy metals from the environment. I am not to familiar with what species works best or if this would even work for this area, but it could hold some potential. California’s levee system needs a major overhaul anyway, so why not make it more functional in relation to our ecosystem. As much as farmers are against this project, they are not the only one’s affected by it. California is certainly an agricultural state, but this is not the only industry located here. We have mountains to the east, a great basin for agriculture and a coastline that stretches almost the entire length of the continental United States. If we lose our spawning habitat, global consequences could result and we have to have the long term effects in mind when making decisions about how we treat our home. I know that farmers have a right to make a living, but something needs to be done to correct past mistakes or we will all suffer, not just the farmers. The Nigiri Project is not the ultimate solution, but it is the step in the right direction. To conserve the Salmonid population and benefit the agriculture aspects of farmlands, the Nigiri project appears to be a brilliant proposal to satisfy the two. Using rice fields as a growing environment for the salmons will greatly boost the population however, I believe that the problem of the mercury exposure is very crucial and should be taken into top priority for the salmon’s safety. Mercury exposure is hazardous not only to the fishes but to other species as well, in which becomes a cycle, starting with the salmons. Therefore, before it any initiation, the mercury problem should be resolved beforehand. The Nigiri Project concept is exciting. It has potential not only for demonstrating viable, sustainable business collaboration between competing interests, but also has potential for tremendous public outreach and education. Perhaps it could become a fun destination to learn about conservation, and perhaps enjoy some very fresh sushi on site? With the initial idea of expanding the floodplains and moving the levees farther out, farmers were placed in a tight position. The Nigiri Project seems to be a happy medium for both farmers and salmon. Aquatic vertebrate densities will increase and farmers will not be greatly effected. What interested me was the mercury mining and how salmon were impacted. Easily one thinks that it stops at this level, but it is just the initial reaction. Soon the mercury will be found in birds, other predators, and humans through consumption of the salmon. Therefore, it is essential to stop the cycle before it begins. Even though the article suggested reducing the concentrations, I feel that reducing the exposure, possibly through screening or some other method, would be a better overall solution. I think the Nigiri project would be a brilliant way to conserve the salmonid population, simply because it involves the farmers and conservation ecologists working together. The farmers would be providing a habitat for salamonids, hopefully, without much damage to their crops. In my opinion farmers would offer their rice fields as habitat if they were receiving compensation from the salmonid sales. Also, I think the salamonoids follow an r strategist life cycle, so growing them in fisheries with excessive resource availability and low predation threats, can dramatically improve population size. Furthermore, the impact of human carbon emissions can clearly be seen with the formation of high concentrations of methylmercury. I think it is more detrimental to the salmonid population in the Central Valley watershed to build floodplains because we are unsure how much mercury lies within the sediment. By building these floodplains, we may put the salmonid population at risk for mercury poisoning. The result of this occurring could affect many people who like to consume salmonids and put them at risk of mercury poisoning as well. The drawbacks seem too high because mercuric poisoning that may result from floodplains being built in the Central Valley affects the salmonid population and, eventually, the human population through fish consumption.